The holiday season has officially started, and the staff here at EMA are really getting into the spirit. This time of year can be particularly stressful filled with end of year deadlines, shopping, and snow. Take a break from the holiday rush, and get your creative juices flowing with our Official Holiday Caption Contest! Give us your best electrical interpretation of this holiday image and enter to win fun prizes for electrical engineers. Enter by sending your caption via Twitter (@EMA_EDA), posting to our Facebook page (EMA Design Automation), comment on the post on our LinkedIn , or email us (emamarketing@ema-eda.com). The deadline for entries has been extended to Tuesday, December 20th 2016, winners will be announced December 21st, 2016*. This contest is open to the public, recognizing that once submitted all entries become the sole property of EMA Design Automation. First prize winners will get a PCB Christmas Tree and circuit board conductive paint card set (as seen in our previous blog post), as well as a mini drone. One honorable mention will receive an EMA swag bag. Please enjoy this fun contest brought to you by EMA Design Automation. We wish you a grounded holiday season and a powerful new year! Grand Prize winner, Robert Nelson "Who gave you the green light for this design?!!" Honorable Mention, Jordan Lippitt "During the technical review Blitzen said that the nose was the wrong color, but I’m not seeing it. 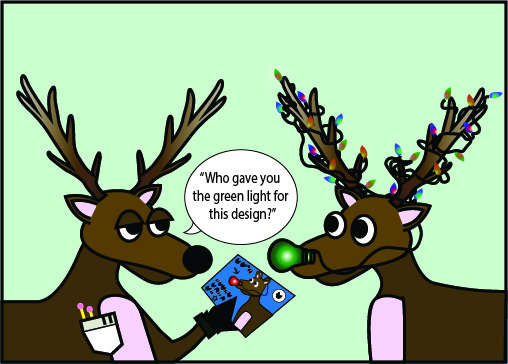 —Donner, the red-green colorblind reindeer"
Honorable Mention, Shawn Harden "Dec 24th, Rudolph’s dad finds his “sick” son’s attempt to Ferris Bueller his way out of work." Please contact us at emamarketing@ema-eda.com to claim your prize.